Dryer vents are an often-overlooked part of home maintenance. After you clean your lint filter, it’s easy to assume that there’s no other buildup from running your dryer. However, dryer vents can build up excessively and cause serious issues. Whether it’s the fire hazard posed by lint in the line or the degradation of your appliance’s efficiency, the risks are real. There are a few quick ways of determining if your dryer vent has a clog, they don’t even require you to remove any of the duct work or hose. 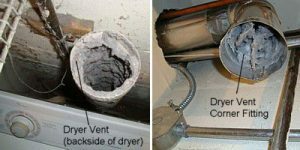 It’s really quite simple: if your clothes aren’t dry after a 45 minutes dry cycle, or if your dryer becomes excessively hot after a cycle, you likely need your dryer vent cleaned. Left unattended, this will become a serious fire hazard, that’s worth fixing now. ServriteNJ offers multiple services to help you clean and restore your home. Please visit the following pages to discover how we can help you with the following services water damage repair NJ, South Jersey Fire Damage Restoration, mold removal New Jersey, Southern NJ air duct cleaning or South Jersey Carpet cleaning.